Our policy at Goatsbridge Trout Farm is to use the best management practices we can to minimize environmental impacts from fish farming. 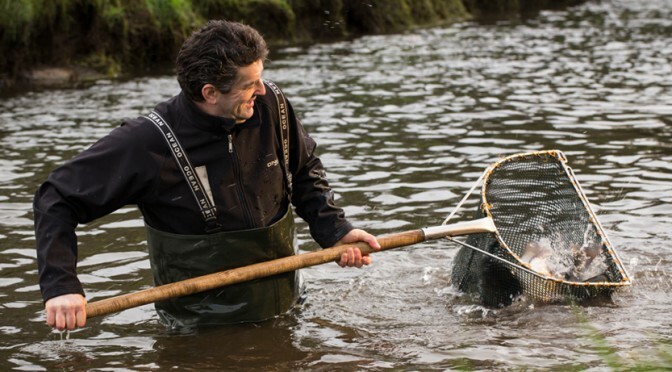 This means that Goatsbridge Rainbow Trout have plenty of space to swim around in the ponds, resulting in our fish being stress-free and less likely to get sick and suffer from diseases. Our rainbow trout are farmed in earthen ponds, whereas modern trout farming is usually carried out in concrete ponds or raceway systems. Earthen pond farming is an old traditional Danish system, and to date, it is one of the most natural environments where fish can be grown. We do not use chemicals and antibiotics (unless the poor fish are seriously sick and suffering!) and you can be sure that the quality we supply is always at the highest standards and the most nature-like you can find on the market. Nowadays fish farming is strictly regulated through restrictions on nutrients discharge, use of additives, waste control and recording of any movement of fish in and off site. Due to all of these requirements, European fish is a very healthy seafood product when compared to imported seafood from Asian countries. Fish farming is not only about environmental issues, but also about social issues. We are Verified Members of Origin Green, a sustainability programme that operates on a national scale in Ireland. We set and achieve measurable sustainability targets that include reducing our environmental impact, working with and supporting local communities and protecting the beautiful, natural resources around our fish farm and beyond. Fish farming is hard work and as it’s often carried out in very remote locations, fish farmers can have a hard time. Irish fish farms comply to the greatest level in terms of social welfare, and we can tell you that Goatsbridge in particular is the best fish farm to work in!! We look forward to receiving all the questions you might have about our trout, whether it be concerning fish farming in general or more specifically about our farming methods and you’re always welome to drop by, or take part in the Taste Trail tours. In the meantime, here’s a short video that explains the concept behind Origin Green. Best fishes to you all!! The team of Goatsbridge Trout Farm. Its grreat to know you’re committed to sustainable and healthy fish production. I just have a query about their food. What do your trout eat? What do you you feed them? What does their food come from/harvested from? Beautiful initiative I buy your trout each week to feed to my child with peace of mind about her health and a clean conscience about the environment. My next challenge is to get my Irish husband to eat it! I come from Spain where people are obsessed about seafood, why do you think so many people are adverse to it here?